Vera Rubin held various academic appointments for the next eleven years. She served for a year as an Instructor of Mathematics and Physics at Montgomery County Community College, then worked from 1955-1965 at Georgetown University, as a Research Associate Astronomer, Lecturer (1959-1962), and finally, Assistant Professor of Astronomy (1962-1965). She joined the Carnegie Institute in 1965, as a Staff Member in the Department of Terrestrial Magnetism, where she met her long-time collaborator, instrument-maker Kent Ford. Because she had young children, she did much of her work from home. In 1963, Rubin began a year-long collaboration with Geoffrey and Margaret Burbidge, during which she observed the rotation of galaxies for the first time at the McDonald Observatory’s 82 inch telescope. During her work at the Carnegie Institute, Rubin applied to observe at the Palomar Observatory in 1965, despite its tacit rule that women were not allowed. She created her own women’s restroom, sidestepping the lack of facilities available for her and becoming the first female astronomer to observe there. At the Carnegie Institution, Vera Rubin began work related to her controversial thesis regarding galaxy clusters with Ford, making hundreds of observations using Ford’s image-tube spectrograph. This instrument allowed Rubin to amplify starlight and view astronomical objects that were previously too dim to see. The Rubin–Ford effect, an apparent anisotropy in the expansion of the Universe on the scale of 100 million light years, was discovered through studies of spiral galaxies, particularly the Andromeda Galaxy, chosen for its brightness and proximity to Earth. First appearing in journals in 1976, the idea of peculiar motion on this scale in the universe was a highly controversial proposition, dismissed by leading astronomers but ultimately shown to be valid. The effect is now known as large scale streaming. The pair also briefly studied quasars, which had been discovered in 1963 and were a popular topic of research. Wishing to avoid controversial areas of astronomy, including quasars and galactic motion, Vera Rubin began to study the rotation and outer reaches of galaxies, an interest sparked by her collaboration with the Burbidges. She investigated the rotation curves of spiral galaxies, again beginning with Andromeda, by looking at their outermost material, and observed flat rotation curves: the outermost components of the galaxy were moving as quickly as those close to the center. This was an early indication that spiral galaxies were surrounded by dark matter haloes. She further uncovered the discrepancy between the predicted angular motion of galaxies based on the visible light and the observed motion. Her research showed that spiral galaxies rotate quickly enough that they should fly apart, if the gravity of their constituent stars was all that was holding them together; because they stay intact, a large amount of unseen mass must be holding them together, a conundrum that became known as the galaxy rotation problem. Rubin’s calculations showed that galaxies must contain at least five to ten times as much dark matter as ordinary matter. Rubin’s results were confirmed over subsequent decades, and became the first persuasive results supporting the theory of dark matter, initially proposed by Fritz Zwicky in the 1930s. This data was confirmed by radio astronomers, the discovery of the cosmic microwave background, and images of gravitational lensing. Her research also prompted a theory of non-Newtonian gravity on galactic scales, but this theory has not been widely accepted by astrophysicists. Another area of interest for Rubin was the phenomenon of counter-rotation in galaxies. Her discovery that some gas and stars moved in the opposite direction to the rotation of the rest of the galaxy challenged the prevailing theory that all of the material in a galaxy moved in the same direction, and provided the first evidence for galaxy mergers and the process by which galaxies initially formed. 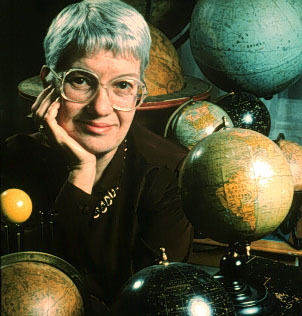 When Vera Rubin was elected to the National Academy of Science, she became the second woman astronomer in its ranks, after her colleague Margaret Burbidge. Rubin’s perspective on the history of the work were presented in a review, “One Hundred Years of Rotating Galaxies,” for the Publications of the Astronomical Society of the Pacific in 2000. This was an adaptation of the lecture she gave in 1996 upon receiving the Gold Medal of the Royal Astronomical Society, the second woman to be so honored, 168 years after Caroline Herschel received the Medal in 1828. She continued her research and mentorship until her death in 2016.